Last week we did a deeper dive on our latest poll in Senate special election. We aren’t planning another poll in the race (unfortunately), so this week we have compiled responses to some of the key questions across four polls we conducted for WBUR in this race. Click here to download the PDF. About the same number of men and women have an unfavorable opinion of Gomez, but there is a considerable gender gap in his favorability. More women remain undecided about him, and more women than men have never heard of him, even in our most recent poll (7 percent, compared to 2 percent among men). Combining polls also allows for better analysis of subgroups that make up a small part of the sample in an individual poll. For example, a poll of 500 voters in Massachusetts will usually only include about 60 registered Republicans. It is difficult to infer much from such a small sample, but by combining Republican responses across several polls, we can see whether Republican responses across each poll are consistent. This is an example of how looking across polls can help determine whether the numbers for a smaller subgroup are more likely to represent a stable dynamic within the electorate of if they are just statistical noise, as can happen with groups of fewer respondents. 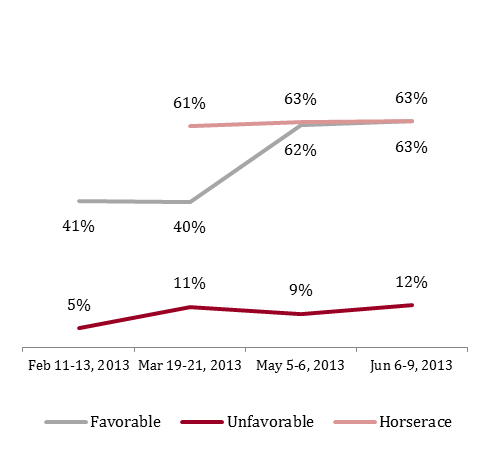 For example, looking across four polls it’s clear that Republicans quickly got to know and like Gomez. And that familiarity bred support: the percentage of Republicans planning to vote for him quickly rose. Markey has also seen his favorability among Democrats increase, but not to the heights that Gomez enjoys with his party. 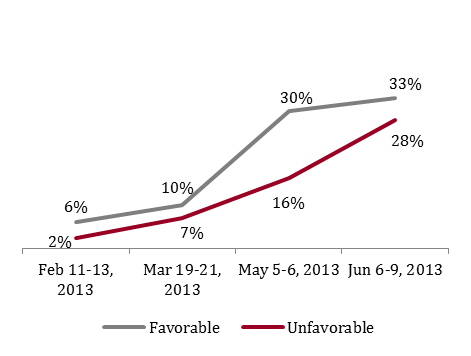 And even as his favorability has climbed, Markey share of Democratic votes has plateaued just north of 60 percent. Not every question was asked in every poll. In cases where we do not have data from a particular poll, you’ll see 0% in those cells. Not every question from every poll is covered – only the Markey v. Gomez “horserace” question and favorable/unfavorable numbers for both candidates. Full topline and crosstabs for each poll are available at WBUR.org and, via links, at massincpolling.com. 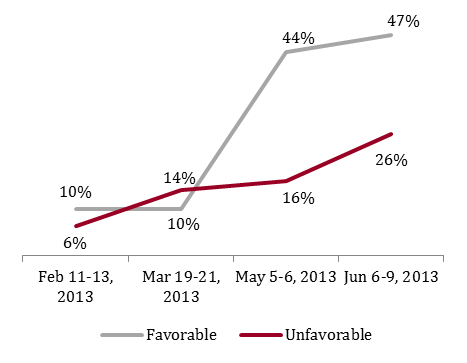 We excluded our first poll in this race, which was from December 2012, before candidates had declared. 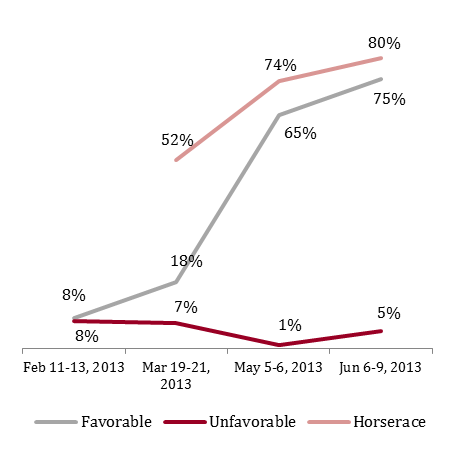 Markey was included among potential candidates in that poll, but not Gomez. Percentages are by row, not by column. So the example below means that 45 percent of men supported Markey in our March poll, not that 45 percent of Markey’s voters were men. We hope readers find this data useful. 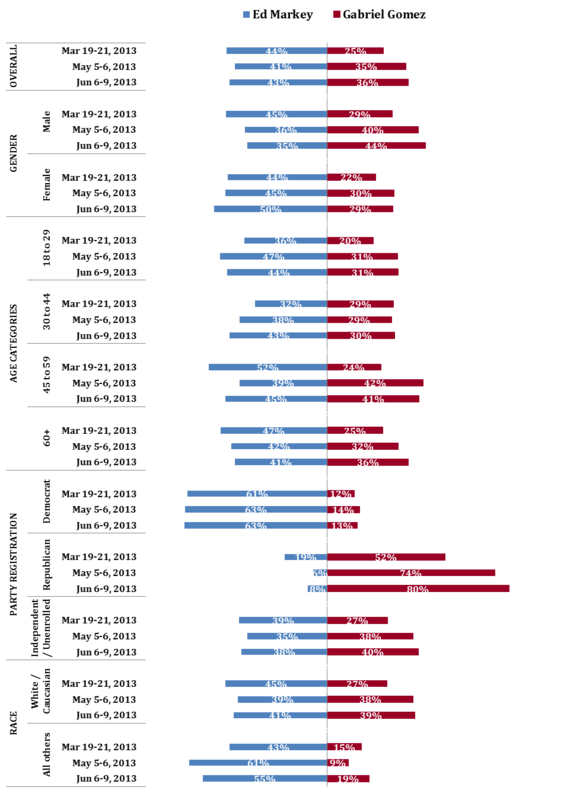 Tweet your observations/visualizations on the data @Massincpolling, and remember to vote on June 25. What’s trending in the Senate race, part two: what issues matter most to voters?